Whether you’re new to mountain biking or in need of a few pointers to increase your speed for the coming racing season, then it’s worth spending a little time and investment in professional coaching. Within a few hours improvements are easily noticeable. Bad habits are highlighted and kicked into touch, resulting in a smoother, confident and ultimately faster you. Ian Bailey is the Irish guru of MTB coaching – he’s literally written the book on how to professionally coach mountain biking. As the man who’s designed the Mountain Bike Leader qualification – the highest accolade for MTB instructors in Ireland and the UK – Ian actually certified and approved the majority of those listed below, teaching them the necessary skills of leading, guiding and coaching. Primarily based in the stunning Mourne Mountains, Northern Ireland with easy access from both Belfast and Dublin, he also regularly works all over Ireland. With a decade of instructing behind him and a lifetime of riding bikes under his belt, you’ll be in safe hands with Ireland’s most qualified and experienced mountain bike specific coach and tutor. Along with running national trail centres at Ticknock, Co. Dublin and Ballinastoe, Co. Wicklow, plus organising the Gravity Enduro Ireland Series and Biking Blitz, biking.ie regularly host coaching sessions and riding clinics. With six instructors on hand, they are mainly focused in the Dublin and Wicklow area and cater for all ages and abilities. Fully certified, group lessons are every Saturday morning, while Sundays are specific for children, with additional camps organised during the school holidays. As the saying goes, Glyn O’Brien has probably forgotten more about mountain biking than we’ll ever know. 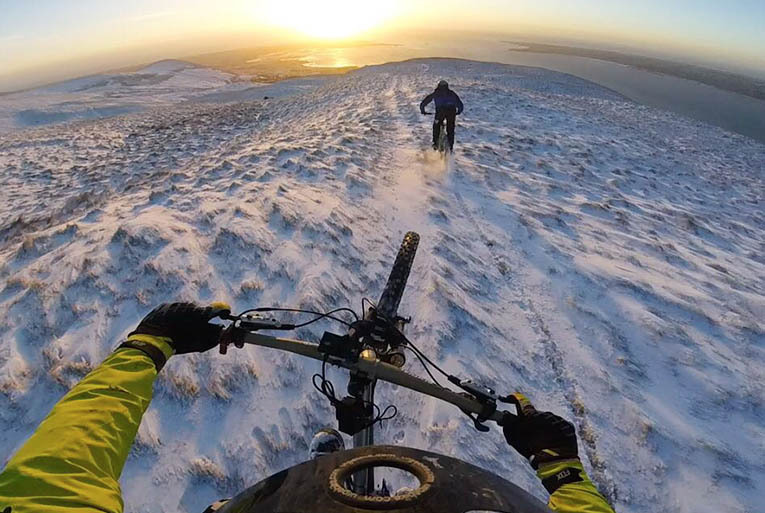 Bonafide legend of Irish MTB, Glyn has been riding bikes since the days of black ’n white. With credentials reading a career in World Cup Downhill, Red Bull Rampage podium, Irish National DH champion plus most recently crowned the 2018 Vitus First Tracks Enduro Cup champion – a series he also organises – you’ll be hard pushed to find a more experienced rider and instructor on these shores. With the popular Rostrevor Mountain Bike Centre at their disposal, East Coast Adventure have a complete range of coaching courses to suit all needs. Ranging from beginner to advanced for riders eager to improve their race craft, the skills courses are six hours long split into two-hour sessions over three weeks. The Gearing Up Off Road is Cycling Ireland’s mountain bike skills programme and is designed to help you develop the skills needed to safely and competently enjoy mountain biking. The advanced course covers everything required to ride at speed, line selection, tackling wet roots, drop offs, jumps, off-camper techniques, tyre selection, air pressure and other useful tips which you can then take away and use for leisure riding or racing events. Now 10 years qualified, Trail Riders are two of the most experienced instructors in Ireland. Based in Ballyhoura, they don’t just have the country’s largest network of trails at their disposal but can show you how to perfect your riding technique to get the best out of them. Chris says they divide their coaching into two parts. Level 1 is about getting the basics right and knowing how to read the trail ahead, while Level 2 is for more experienced riders looking to improve their enduro race craft. One cool addition is that participants receive a booklet to take home which features the skills learned allowing you practice a different one each day when you go riding. When he’s not racing professionally in the Enduro World Series for Chain Reaction Cycles Mavic Enduro Team, Kelan Grant is still down the woods helping others improve their skills. One of the smoothest and stylish riders on the scene, the 2017 Irish Enduro Champion and Red Bull Fox Hunt winner feels his approachable and easy-going demeanour puts his students at ease allowing them to confidently improve their riding. At 19 years old, Tommy Magnenat is the youngest coach on our list but has a life time of two-wheel riding behind him. Spanish, he recently moved to Northern Ireland to work with the Life Adventure centre in Castlewellan and having completed his coaching course started training in September 2018. Tommy says what he enjoys most about his job is seeing riders improve with each session. As a four-time Red Bull Fox Hunt champion and Masters World Downhill Champion, Colin Ross, knows a thing or two about MTB. But he’s also very adept at converting that knowledge into clear and specific coaching. Quick to put you at ease, you’ll be up to speed in no time! For those considering a warm weather training camp, Point1 Athletic’s Chris Kilmurray is hosting a weeklong EWS specific training and race preparation camp in conjunction with MTB Beds at Finale Ligure, Italy this May. The Irish man is coach and mentor to many world-class mountain bike riders including Greg Callaghan, Tahnee Seagrave, Kay Winton and Kelan Grant. As a consultant coaching expert for the UCI & World Cycling Centre in Aigle, Switzerland in addition to coaching duties at UCI DH World Cups and Enduro World Series events Chris has gained the experience needed to help any type of rider progress.